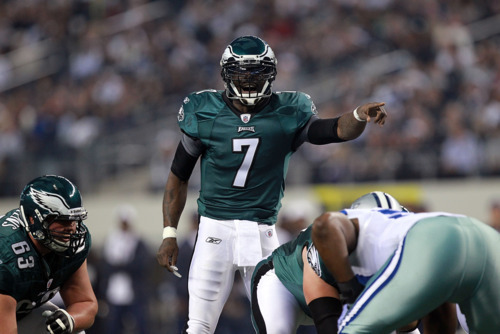 One of the unheralded stories of 2011 is the regression of Michael Vick. After borrowing Superman’s cape last season, Vick returned to mere mortal status once again. Just as a simple measurement, in 2010 he had quarterback passer rating above 90 in 10 out of his 12 games. This year, he’s only had 5 out of 12. However, things seem to be picking back up for Vick as he and the coaches are potentially finding some answers for him. He’s had back-to-back 100+ QB rating games for the first time this season over the last two weeks. I charted all of Vick’s passes this week and noticed that he’s hardly ever doing three step drops from under center anymore. In fact, I counted only two of those, and both went for incompletions. The majority of pass calls (20 of 36) involved Vick in shotgun, and half of those added five step drops on top of the pre-snap depth. Whether his height factors in to this I can’t say, but he’s clearly more comfortable and effective in shotgun, and generally as far back from the line of scrimmage as possible. The added depth gives him more time to find deep receivers and also more space to scramble if necessary. Danny Watkins is awful. I want to really emphasize this point. After watching him fairly closely the whole game, it’s clear that he didn’t deserve to be on the field. At least half a dozen times, Watkins single-handedly let his defender get by him (often instantaneously) to get pressure on Vick or a backfield tackle on LeSean McCoy. It was Kyle DeVan, Stacey Andrews, Winston Justice-against-the-Giants bad. I wish that were the case. In reality, Watkins needs to make a big leap in the offseason to be even an average NFL starter. Speaking of below replacement level starters, Jamar Chaney was almost as bad. If you run straight up the middle and fail to block the middle linebacker against 31 teams in the NFL, it must be a tackle for a loss more often than not. Against the Eagles, it’s a nine yard gain. I’m not exaggerating when I say that the run defense frequently looks like it only has 10 players out there. Chaney demonstrates no ability to get off blocks. But more importantly, even when unblocked he’s indecisive and slow. You can tell that he’s athletic enough to run with most tight ends, but in run defense he never charges the line. At best he’s a speed bump 3 yards into the run, but most of the time he doesn’t even provide that. Just to prove I’m not always negative, let me say some good things about Casey Matthews. He looked, frankly, great this week. Speedy, instinctive, good in space, and quick to take on tight ends and running backs out of the backfield. I’d actually like to see him get some of Chaney’s snaps in the base defense next week. Clay Harbor was instrumental as a blocker on the back-to-back end-arounds to DeSean Jackson. Set the edge with a hard block on Sean Lee the first time, then faked a block on Ware, shouldered Lee, and got up to the third level on Jackson’s second try. That said, there’s no reason Harbor should be one-on-one with DeMarcus Ware in pass protection. That led to a sack. Brent Celek, on the other hand, continues to show me nothing but poor run blocking. But every week they add another brilliant tight end screen to the playbook, and he’s great at that. Brandon Hughes got some significant looks as the dime corner, especially when Nnamdi Asomugha came inside to cover Jason Witten. Hughes was beaten once each by Dez Bryant and Miles Austin, two good receivers, both times he was targeted. Tagged with Philadelphia Eagles, NFL, Week Sixteen, Dallas Cowboys, Michael Vick, Shotgun, Danny Watkins, Tommy Lawlor, Pressure, Pass Blocking, Run Blocking, Jamar Chaney, Linebackers, Casey Matthews, Clay Harbor, Brent Celek, Brandon Hughes. December 29, 2011 by Brian Solomon.